Kevo installed on my front door. How many times have you fumbled for the keys while holding a bag of groceries in your arms? Wouldn't be great if your home could recognize you as someone authorized to enter and unlock the door? That's the promise of the Kwikset Kevo powered by UniKey, a keyless deadbolt lock that operates via the latest and smartest Bluetooth LE (low energy technology). The Kevo pairs with your smartphone, or the included Bluetooth keyfob, and recognizes you when you come within range. So you don't unlock the door unintentionally, you need to touch the lock to unlock it. Or, you can use a key, just like any other lock. You also can email Kevo keys via the Kevo app to other users, such as children, spouses or house guests, and retrieve them when they are done. And, you see when each key was used or set up an alert for a key, so you know your child has arrived home from school. 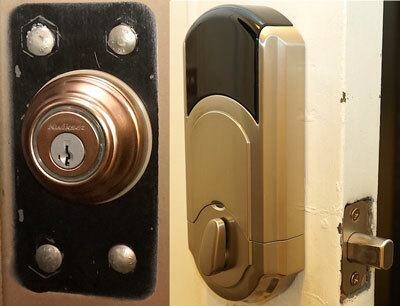 Despite its touchy operation, Kevo otherwise looks, installs and acts like any other boring interior deadbolt lock. Don't be daunted by the three dozen or so parts in the box. 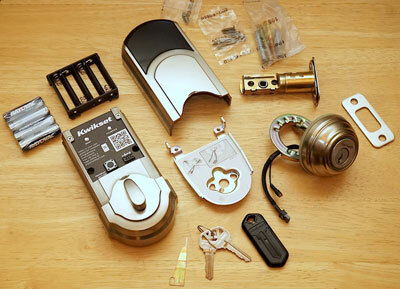 Even if you've never installed a bolt lock, disassembling your current deadbolt, along with the instructions, will reveal how easily the Kevo is installed. The removal of your old internal deadlock and replacement with the Kevo should take no more than 15-20 minutes. Kevo operates on four AA batteries, which last for around a year. After you assiduously adhere to the three-step battery installation process, you have to calibrate the lock to your smartphone and then the fob, an annoyingly repetitious process that can take almost as long as the physical installation. You do not have to have your smartphone or fob out to touch open your Kevo, nor does the Kevo app have to be booted – just as long as your smartphone or fob is on your person, in a pocket or bag. Someone standing within a few feet of you also can touch-to-open your Kevo – but not someone inside your house. Once you touch your Kevo, blue LEDs circle around the lock face. When your smartphone or fob is recognized, the blue light ceases and you'll hear a whirring sound as the deadbolt moves. 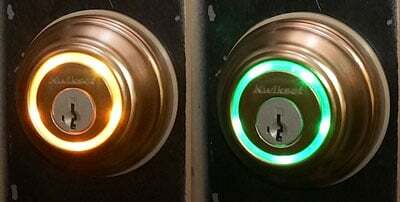 The circular Kevo LEDs then light green when unbolted, orange when locked. Kevo doesn't work 100 percent of the time – unscientifically I'd guesstimate it operates as planned around 95 percent. But even if you have to tap a second time, the 3-5 second touch-to-open wait time is still faster – and cooler – than locating your keys, identifying your specific front door key, opening the door, and returning your keys to their storage place. The Kwikset Kevo powered by UniKey is available for $219.00 on Amazon, additional fobs cost $24.99 on Amazon.